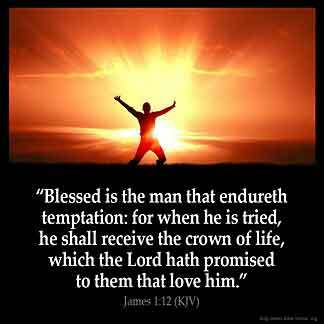 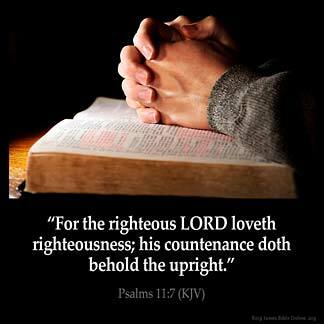 Psalms 11:7 — "For the righteous LORD loveth righteousness; his countenance doth behold the upright." 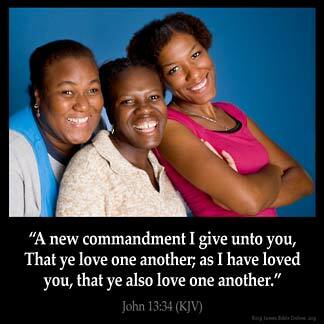 John 13:34 — "A new commandment I give unto you, That ye love one another; as I have loved you, that ye also love one another." 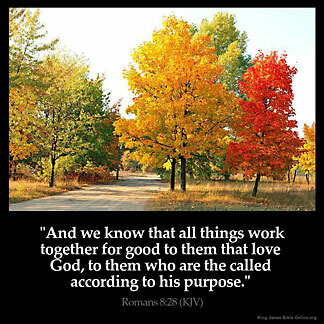 Romans 8:28 — "And we know that all things work together for good to them that love God, to them who are the called according to his purpose." 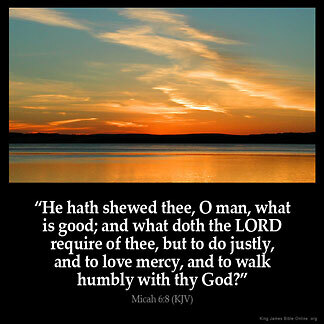 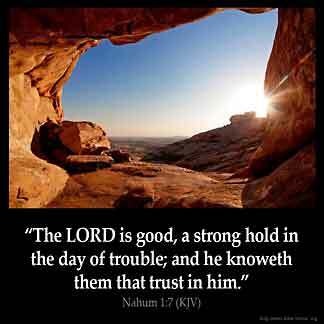 Nahum 1:7 — "The LORD is good, a strong hold in the day of trouble; and he knoweth them that trust in him." 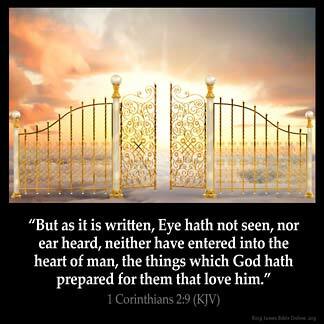 1 Corinthians 2:9 — "But as it is written, Eye hath not seen, nor ear heard, neither have entered into the heart of man, the things which God hath prepared for them that love him." 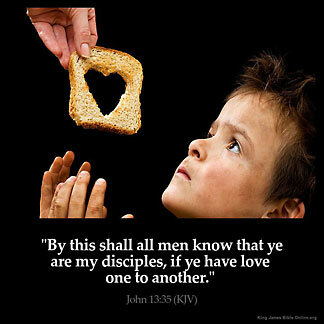 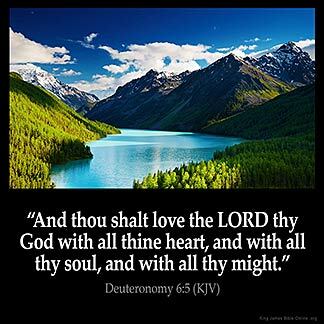 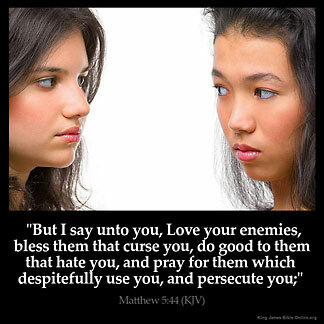 Matthew 5:44 — "But I say unto you, Love your enemies, bless them that curse you, do good to them that hate you, and pray for them which despitefully use you, and persecute you;"
John 13:35 — "By this shall all men know that ye are my disciples, if ye have love one to another." 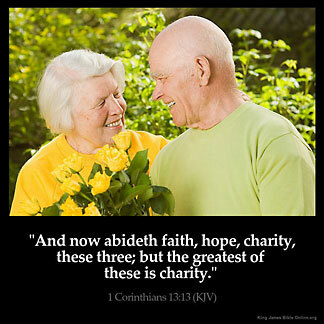 1 Corinthians 13:4 — "Charity suffereth long, and is kind; charity envieth not; charity vaunteth not itself, is not puffed up,"
Micah 6:8 — "He hath shewed thee, O man, what is good; and what doth the LORD require of thee, but to do justly, and to love mercy, and to walk humbly with thy God?" 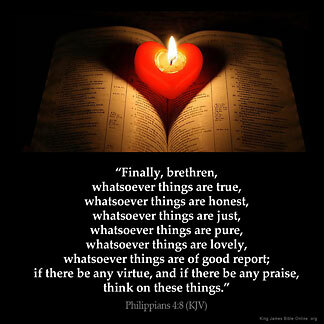 Philippians 4:8 — "Finally, brethren, whatsoever things are true, whatsoever things are honest, whatsoever things are just, whatsoever things are pure, whatsoever things are lovely, whatsoever things are of good report; if there be any virtue, and if there be any praise, think on these things." 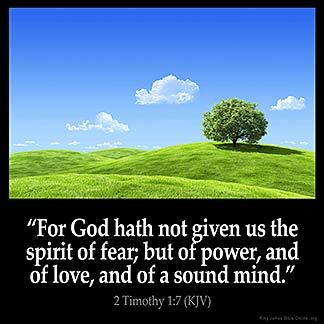 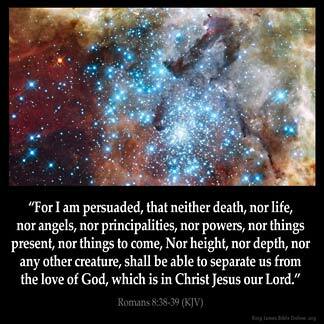 2 Timothy 1:7 — "For God hath not given us the spirit of fear; but of power, and of love, and of a sound mind." 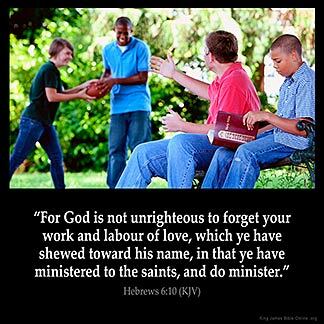 Hebrews 6:10 — "For God is not unrighteous to forget your work and labour of love, which ye have shewed toward his name, in that ye have ministered to the saints, and do minister." 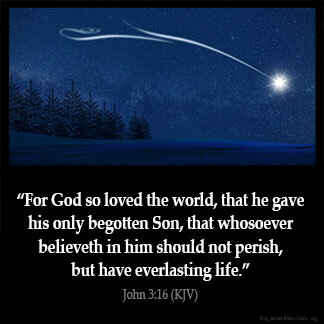 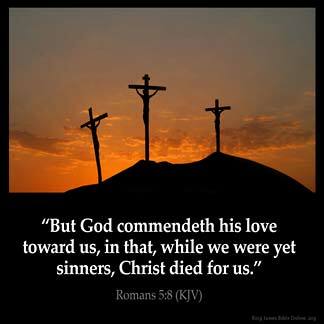 John 3:16 — "For God so loved the world, that he gave his only begotten Son, that whosoever believeth in him should not perish, but have everlasting life." 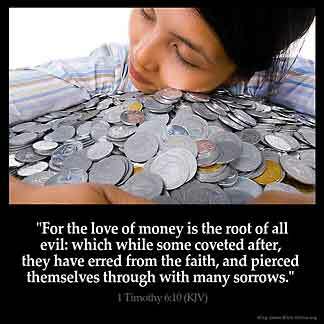 1 Timothy 6:10 — "For the love of money is the root of all evil: which while some coveted after, they have erred from the faith, and pierced themselves through with many sorrows." 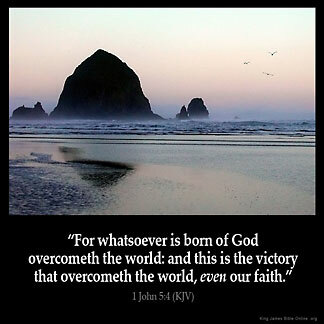 1 John 5:4 — "For whatsoever is born of God overcometh the world: and this is the victory that overcometh the world, even our faith." 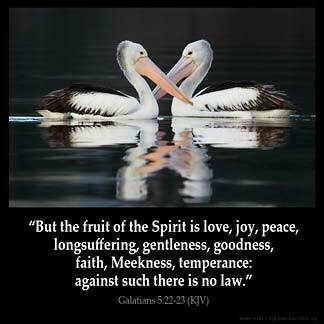 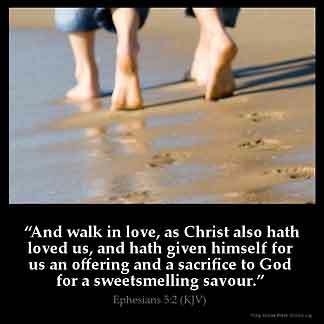 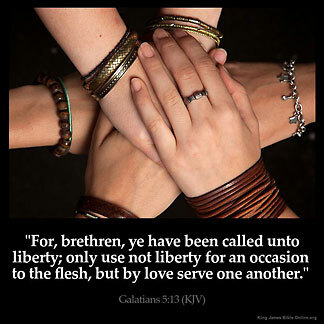 Galatians 5:13 — "For, brethren, ye have been called unto liberty; only use not liberty for an occasion to the flesh, but by love serve one another."